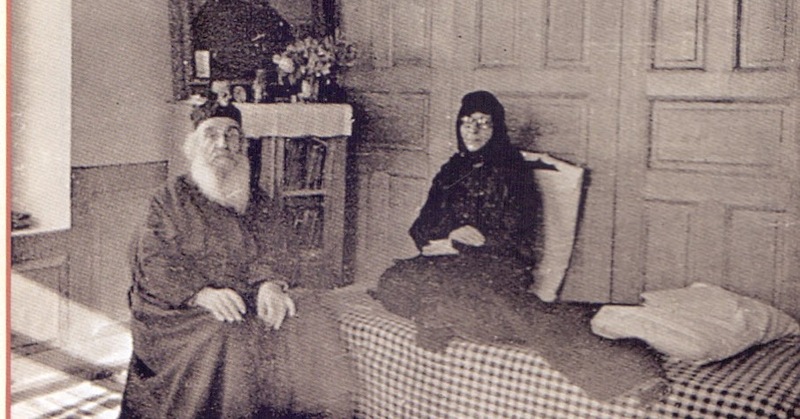 The following sayings of Saint Amphilochios Makris were addressed to his spiritual children, primarily the nuns under his care. = When you cultivate prayer, the Tempter's blusterings will not trouble you. Prayer diminishes his strength; he cannot do anything to us. = The end of my life draws near. I ask you to live a holy life, to walk along holy paths, so that you may help both our Church and Greece. = Remaining faithful to Monasticism is considered to be a martyrdom. = Christ often comes and knocks at your door and you invite him to sit in the living-room of your soul. Then, absorbed in your own business you forget the Great Visitor. He waits for you to appear and when you are too long in returning, he gets up and leaves. At other times, you are so busy that you answer him from the window. You don't even have time to open the door. = You are royalty, destined for the heavenly bridal chamber. = When you see someone who is spiritually tired do not burden them any further, because their knees won't be able to bear it. = Love the One, so that even wild beasts will love you. = True wealth, for me, is to see you in the Kingdom of Heaven. = When the flame of love exists, it consumes whatever evil approaches. = The person who loves spiritually feels prayerful, so that he can be found within God and his brother. = The person who loves is saddened when his brother is not advancing well and prays for his progress. = Whoever has Christian love never changes. = Hold the banner of Christ up high, so that you've always got your elder's telephone number, no matter where you are. = Christ is the same, yesterday and today, but we have closed our eyes and look into the darkness. = It is because we carry on like this that some fall in the mud and others are killed. = All those things that we hear about: war, earthquakes, catastrophes, thunder, also expect rain. = We must be ready for our defense and our martyrdom. = I beseech the Lord to sanctify you, so that I may see you in Paradise. This is the dowry which I seek from the Lord for you. = For God's Grace to come during the Liturgy, you must be concentrated and untroubled. = The more a person loves God, the more he loves other people. He loves them with holiness, respect and refinement, as images of God. = When a person lacks inner warmth, he will be frozen and cold, even in summer. = When your heart does not have Christ, it will contain either money, property or people instead. = Please put this commandment into practice: Cultivate love towards the Person of Christ to such an extent that, when you pronounce His name, tears fall from your eyes. Your heart must really be aflame. Then He will become your teacher. He will be your Guide, your Brother, your Father, and your Elder. = Love your Bridegroom Christ with all your heart and then everyone will love you and take care of you. = I desire the rebirth of Monasticism, because in my opinion, monasticism is the “evzone” [an elite Greek military unit] battalion of the Church. = God's protection diminishes temptation. = Because of widespread corruption, people cannot understand that spiritual love exists. = Worldly people tire you, because whatever is stored up inside them comes at you like waves of electricity. We must be people of grace so much so that whoever comes to us may find rest. = Let us look upon everyone as our superiors, however weak they may appear. Let us not be harsh, but always bear in mind that the other person also has the same destination as us. = We must have Love, even if they do us the greatest harm, we must love them. We will be able to enter Paradise only with love. = Cultivate the Jesus Prayer and a time will come when your heart will leap with joy, just as it does when you are about to see a person who you love very much. = Do not neglect evening prayer. Pray with eagerness like those who are going to a feast. They are awake and feel joy alone. Thus, since you are going to speak with your Bridegroom, do not listen when the Tempter tells you various things in order to hinder you, because you know there is someone who cares for you. = A person can be raised up above the earth by two wings, one is simplicity and the other is purity of heart. You must be simple in your actions and pure in your thoughts and feelings. With a pure heart you'll seek God and with simplicity you'll find Him and be glad. = A pure heart passes through Heavens gate with ease. = Self-denial must be cultivated with discernment; otherwise we may reach the point of suicide. = We are on the high seas of life, sometimes there are storms and at other times calm. God's grace does not leave us. Otherwise, we would have sunk, if he had not held us up. = The saints always look to the other life. It is the grace of the remembrance of death. = God guards us from temptation. He does not allow us to be tempted beyond our strength; He allows everything, for our own good. = When spirituality increases, even sleep will have been fought off. = Prayer is grace. God gives it when zeal and humility exist. = Fight the Hater of Good, who envies you, bravely suffer whatever befalls you with fortitude, patience and faith. = Do not allow your soul's enemy to wage war against you. He appears in sheep's clothing, supposedly wanting your soul's benefit. = Trust in the Lord always and he will nourish you in time of hunger. = With a good word for your neighbor, supporting him, you buy paradise. = Repentance must occur, not from fear of punishment but because we have sinned before God. = Sweeten your thoughts with words of consolation and hope. Warm your words with the warmth of your love towards your Bridegroom and remember His Passion, which he underwent for you, so that you would remain firm, devoted and humble. = Give your whole self completely over to the protecting veil of the Panagia. = Love giving hospitality, my child, for it opens the gates of Paradise. In this you also offer hospitality to angels. "Entertain strangers so that you won't be a stranger to God." = The saints submitted to whatever God sent them, with childlike simplicity, "That's the way You want it. Let Your will be done." = Hospitality... the greatest of virtues. It draws the grace of the Holy Spirit towards us. In every stranger's face, my child, I see Christ himself. = Sorrow is pleasing to God, in as much as it doesn't take away our courage to fight. = It is necessary and beneficial for a general self-examination to take place from time to time, remembering all former sins. = Leave all your concerns to the hands of God. Ask for whatever you want, like a child asking from its father. = Prayer is a gift from God. Always ask with hope. = Our deeds, dear sister, will not save us; God's infinite mercy will. = Spiritual bonds become unbreakable when they come across a child-like spirit, innocence and sanctity. = Everything seems dark and difficult to a person without Christ. = Every day I pray that I may see you amongst the ranks of women saints. = I don't want to be in Paradise without you, my children. = Question: How do you manage to have such patience and perseverance in everything? Answer: The grace of God helps. I always believe in the power of God, my child, Who alters and adjusts everything for the benefit of our soul. = The person who gets agitated doesn't think straight, logically. = When I see a person who is irritated, I don't listen to what he is saying, but pray for God to pacify him. That's why I don't get distressed. When they calm down, when the time is right, I talk to them because they are then in a position to comprehend their foolishness. = The Grace of God and spiritual union with Him transform a person. Fears and suspicions go away, he doesn't fear death, and views this life, however good it may be, as slavery. = God is visiting you when tears come during prayer. = When a person is simplified, he is deified. He becomes innocent, humble, gentle, free. = Never ever give importance to anything earthly and fleeting. Take care of your spiritual union with God instead. = When you hear your name being criticized act as if you didn't hear. This is Paradise, this is perfection. = Our religion slays the passions, not the body. = Where there is fear of God, wisdom is given. = I want you to be calm so that we can meet. When you're tired the wireless doesn't work. = The Christian is a true human being. He is courteous and polite. He doesn't want to sadden anybody. = Innocence is greater than genius. = A person who suffers from egotism attracts no one. And if he does attract someone he will soon go away. When one comes across a childlike spirit, innocence and holiness the bond becomes unbreakable. = The spiritual life has great pleasures. You fly, you leave the world, you don't consider anything. You become children and God dwells in your heart. = The Grace of the All-Holy Spirit makes a person send out rays. However, other people must have a good receiver in order to realize this. = We must have our gaze fixed on heaven. Then nothing will shake us. = Take communion regularly, pray warmly, be patient and you will see a strong hand holding you. = Christ is near us even if we don't see Him. Sometimes, from his great love, He gives us a slap too. You should be glad. Jesus holds an artists’ chisel in His hands. He wants to make a statue of you, for the Heavenly Palace. = The person who shouts has no strength.